DU is 11-1 against RPI dating back to 1954 when the two teams first met. The only Pioneer loss to RPI in history came in RPI coach Seth Appert’s coaching debut game in Denver in 2006, when Appert turned the tables on his old team behind Jordan Alford’s 38-save performance. Sophomore forward Chase Polacek leads Rensselaer in scoring with four goals and 11 assists for 15 points in 17games. Freshman Patrick Cullen (7 goals, 5 assists) and sophomore Tyler Helfrich (3 goals, 7 assists) are right behind with 12 and 10 points, respectively. However, Helfrich was diagnosed with a sprained MCL in his knee, and will miss this weekend's Denver Cup. Helfrich suffered the injury in the first period the Engineers' 3-1 loss to Miami (Ohio) on Dec. 13. Sophomore Bryan Brutlag (1 goal, 3 assists) leads the team’s defensemen with four points. In goal, Senior Mathias Lange has played 68.3% of the games, posting a 3.08 goals against average with a .910 save percentage and a 2-9-1 record, while freshman Allen York is 1-4-0 with a 4.17 average and an .881 save percentage. RPI was founded in 1824 by statesman, soldier, land-owner and New York Lt. Governor Stephen Van Rensselaer for the "application of science to the common purposes of life", and is the oldest technological university in the English-speaking world. The institute is known for its success in the transfer of technology from the laboratory to the marketplace, and has over 6,000 students on its main campus in Troy, part of the Capital District of Albany, N.Y. on the Hudson River. Stephen Van Rensselaer established the Rensselaer School November 5, 1824 with a letter to the Rev. Dr. Samuel Blatchford, in which van Rensselaer asked Blatchford to serve as the first president. Within the letter he set down several orders of business. He appointed Amos Eaton as the school's first senior professor and appointed the first board of trustees. On December 29 of that year, the president and the board met and established the methods of instruction, which were rather different from methods employed at other colleges at the time. Students performed experiments, explained their rationale, and gave their own lectures rather than listening to lectures and watching demonstrations. The school opened on Monday, January 3, 1825 at the Old Bank Place, a building at the north end of Troy. The opening was announced by a notice, signed by the president, and printed in the Troy Sentinel on December 28. The school attracted students from New York, Massachusetts, Vermont, Ohio, and Pennsylvania. The fact that the school attracted students from afar is attributed to the reputation of Eaton. Fourteen months of successful trial led to the incorporation of the school on March 21, 1826 by the State of New York. In its early years, the Rensselaer School had greater resemblance of a graduate school than of a college. During this period, the Rensselaer School, renamed the Rensselaer Institute in 1832, was a small but vital center for technological research. The first Civil Engineering degrees in the United States were granted by the school in 1835, and many of the best remembered civil engineers of that time graduated from the school. Important visiting scholars included Joseph Henry, who had previously studied under Amos Eaton, and Thomas Davenport, who sold the world's first working electric motor to the institute. In 1847, alumnus Benjamin Franklin Greene became the new senior professor. Earlier he had done a thorough study of European technical schools to see how Rensselaer could be improved. In 1850 he reorganized the school into a three-year polytechnic institute with six technical schools. In 1861 the name was changed to Rensselaer Polytechnic Institute. RPI enjoyed a period of academic and resource expansion under the leadership of President Palmer Ricketts. During Rickett's tenure, enrollment increased from approximately 200 in 1900 to a high of 1700 in 1930. Another period of expansion occurred following World War II. Enrollment for the 1946 school year was so high that temporary dormitories had to be constructed. Fifty surplus metal military barracks, each housing 20 students, were arranged into a trailer-park like camp over a mile from campus nicknamed "tin town.” This arrangement was used by students until new freshman residence halls were opened in 1953. * 1898 - The first association of Latin American students in the United States was formed at RPI, called the Union Hispano-Americans. This organization would later merge with other like-minded organizations and form the first Latin American fraternity in the United States, Phi Iota Alpha, in 1931. * 1961- The institute awarded the first accredited environmental engineering degree in the United States. * 1980 - The institute founds the first business incubator wholly sponsored and operated by a university. * 2007 - The institute is possibly the first university to start an undergraduate major in Video Game Design. In 1999, RPI gained attention when it was one of the first universities to implement a mandatory laptop program. 1999 also saw the arrival of President Shirley Ann Jackson. A graduate of MIT,. She brought with her the "The Rensselaer Plan" an ambitious plan to revitalize the institute. While Jackson had had some tough times with the faculty, many advances have been made under the plan, and Jackson has enjoyed the ongoing support of the RPI Board of Trustees. The Newsweek/Kaplan 2007 Educational College Guide proclaimed Rensselaer Polytechnic Institute one of the 25 "New Ivies", an elite group of 25 schools that provide an education equivalent to schools in the Ivy League. RPI ranks among the top 50 national universities in the United States according to US News & World Report. The same source ranks RPI 24th for "Best Value" in undergraduate education. In 2005, the School of Engineering was ranked 18th in the nation for undergraduates, and 34th in the nation for graduates. Four of the graduate engineering programs are ranked in the top 20 (electrical engineering, materials science and engineering, industrial engineering and mechanical engineering), seven of 11 are ranked in the top 25, and all are ranked in the top 40 in the nation. U.S. News also put the graduate applied mathematics program at 20th. RPI first laced up the skates around the turn of the century, and the beginnings of the program were rough. For the first 14 seasons of the hockey program, RPI never had a coach, and up until 1938, didn’t play more than 6 games per year. There were also only three winning seasons – 1903-04 (1-0), 1906-07 (2-1) and 1927-28 (2-1-1). Prior to 1912, RPI played in different outdoor locations in nearby Cohoes, NY and Albany. In 1912 an outdoor rink was constructed on what is now RPI’s Anderson Field in Troy. It had no formal name, but was usually called the RPI Hockey Rink. There was also a rink on what was then Avenue B (now Sage Avenue). This outdoor rink was constructed and used each year until the program was suspended after 1938, with the exception of the 1936-37 season. That year the rink was built on the tennis courts that were formerly on the west end of '86 Field. 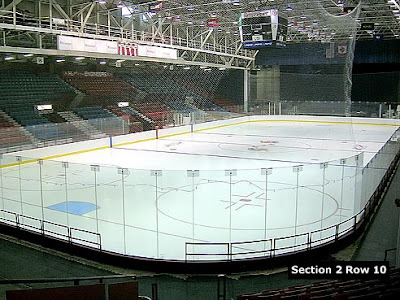 The RPI hockey program was resumed in 1949, when RPI was able to procure a surplus WWII Naval Warehouse from the US Government that had stood in Rhode Island during the war, and re-puposed it into a on-campus 5,000 seat hockey arena. If that story sounds familiar to Denver fans, it’s because Denver’s old DU arena (1949-1997) was also a Naval WWII surplus drill hall (from Idaho), that DU also re-purposed into a hockey arena. RPI’s Houston Fieldhouse still stands today as the home of RPI hockey, named after then RPI president Livingston Houston. Ned Harkness, who came to Rensselaer as an assistant lacrosse coach in 1945, convinced Houston that he would be the right man to guide a men’s hockey team. Harkness focused on building tight bonds with his players, not intimidating them. In those days, however, RPI had no athletic scholarships or residence halls to lure student athletes – players lived in apartments or houses in town. Harkness’ first two RPI teams had losing records, but by 1951-52, the Engineers stormed out to a 15-3 record and a second place finish in the Tri-State League (4-1), but not quite good enough for an NCAA bid. The 1952-53 season saw the Engineers improve in the league to 4-0-1 to win the league title and fashion a 12-game unbeaten streak down the stretch that was a strong enough performance to earn one of the two Eastern bids to the NCAA tournament in Colorado Springs, the first such bid in school history. However, John Mariucci’s Minnesota team downed RPI, 3-2 in the semi final to end title hopes. RPI was able to beat up on BU, 6-3 for third place, with RPI finishing 15-4-1. The 1953-54 season began with seven consecutive victories. But in the championship game of the Rensselaer Invitational Tournament, the Engineers lost 4-1 to St. Francis Xavier of Canada. However, in league competition in the Tri-State League, Rensselaer was rolling right along, sweeping the season series against Clarkson, Hamilton, Princeton, and Middlebury. Then came a disastrous trip west with three non-league games against the University of Denver and Colorado College. Rensselaer limped home after losing all three by a combined score of 19-8. On Feb. 12, 1954, Rensselaer dropped its fifth game, a costly 5-4 decision to St. Lawrence at Appleton Arena in Canton. But St. Lawrence still had to come to Troy. The teams were scheduled to meet on the last night of the regular season, March 5, 1954. Tickets were impossible to find. The game had been sold out for months. The game exceeded the high expectations. Reports from the time claimed it was one of the most exciting, closely contested games ever staged at the Field House. With Rensselaer’s 4-2 triumph, the two teams wound up tied atop the league standings. A vote by coaches and officials would determine which of the two teams would represent the Tri-State League at the NCAA Tournament in Colorado Springs. Boston College, as champion of its league, had already earned its berth as the other Eastern college to qualify for the tournament. To the surprise of many, Rensselaer received the invitation over St. Lawrence. That only seemed to make the team more of an underdog. The team was seeded fourth in the four-team field. Michigan, top seed in the tournament and three-time defending national champion, discovered Rensselaer’s talent firsthand. After all, Boston College, the East’s top team, had been flattened 12-1 by Minnesota in the other semifinal game. What could poor little Rensselaer do against mighty Michigan? On that night, March 12, Rensselaer left Michigan on the short end of a 6-4 defeat. Winger Gordie Peterkin ’55 got the winning goal and a hat trick for emphasis in the upset victory. The victory marked a milestone for the Rensselaer hockey program. It was the first time it had ever beaten a Western school, and it wiped out the bitter taste of the three-game battering they had taken at the hands of Denver and Colorado College earlier in the season. Rensselaer jumped out to a 3-0 lead over Minnesota in the championship game March 13. But the Golden Gophers rallied. And, when they took a 4-3 lead in the third period, it appeared as though the RPI fairy tale was about to end. But RPI had other ideas. Chiarelli dug the puck out of the corner and centered it to Peterkin in the slot. The 5-foot-6 winger snapped off a shot, which slipped through the Minnesota goalie’s pads and into the net. Despite another tri-state league title in 1957, the Engineers would not return to the NCAA tournament until 1960-61 in Denver, when St. Lawrence knocked the Engineers out at the DU arena by a 6-3 score. However, the 30-1-1 Pioneers demolished St. Lawrence 12-2 in the most lopsided NCAA title game ever, so perhaps RPI was fortunate not to face the Pionees that year. The Engineers then joined the ECAC (as well as playing the Tri-State League) in 1961-62) where they’ve been ever since. In 1963-64, Harkness went to Cornell and Rube Bjorkman took over the RPI program, and in his 18-8 lone year in Troy, he didn’t win any league hardware, but his team did secure another NCAA bid, as the Engineers once again returned to Denver and the DU Arena, site of the 1961 and 1964 NCAA tournaments. This time the Pioneers beat RPI 4-1, and RPI went on to beat Providence 2-1 for third place. Michigan, behind Red Berenson’s leadership beat DU in the final to win the title. Bjorkman left for UNH the next season, and RPI settled into 20 year period dry period without another NCAA bid, and never finishing higher than third place in the ECAC. A succession of coaches including Garry Kearns, Leon Abbott and Jim Salfi were unable to get RPI back to ECAC or NCAA prominence. Enter new Coach Mike Addesa in 1981, who in just a few years, built RPI’s greatest era of hockey in the early and mid-1980s. Addessa recruited a nucleus of fine players including RPI career assist and points Adam Oates (who went on to a stellar NHL career), John Carter, a goal scorer who benefitted from Oates’ passes, and a host of other supporting players who went on to NHL careers including Ken Hammond, Mike Dark, George Servinis, Mike McPhee, Darren Puppa and Kraig Nienhaus. RPI’s 1983-84 team went 32-6 and 17-3 in ECAC play, with 5 of the 6 losses by only one goal, and winning the ECAC title, the first in school history, rolling to ECAC tourney victories over rival Clarkson and BU in the Boston to clinch a home NCAA bid to host a quarterfinal series. North Dakota spoiled the fun with a 9-6 two game total goal series victory. The bar had been set very high for the next season, and RPI delivered the greatest performance in school history in 1984-85. The Engineers started play in November with a pair of wins over Canadian schools, but dropped their ECAC opener to St. Lawrence 5-3 on home ice, rebounding to beat rival Clarkson the next night 5-3. The next week, the Engineers flew to Grand Forks to face the always powerful fighting Sioux of North Dakota. RPI dropped the first game in overtime to the Sioux, 7-6, but played their best game of the young season the next night, waxing the Sioux 8-2 on UND’s home ice. That game would be the turning point of the season, as RPI would not lose another game all season en-route to a 35-2-1 record and the school’s second NCAA title. With Oates dishing passes to scorers like Carter and Servinis, and Darren Puppa in the nets, no one could stop RPI. The Engnineers waltzed the rest of the way undefeated to an ECAC regular season title, then thumped Cornell 5-1 and Harvard 3-1 to win the ECAC tournament in Boston. With home ice in the first round of the NCAA’s secure, RPI dispatched Lake Superior State 10-6 in the two game total goals series to earn a trip to Joe Louis Arena in Detroit to face Brett Hull, and Hobey Baker winners Bill Watson and Tom Kurvers and their Minnesota-Duluth Bulldogs in the NCAA semis. RPI eeked out a 6-5 victory in triple overtime, as Carter’s power-play slap shot ticked the stick of a UMD defenseman and beat UMD goalie Bob Mason to send the Engineers to the finals against Providence within 24 hours. Providence was a solid team but had fought their way to the NCAA’s behind the superlative goaltending of Chris Terreri, whose second half of the season carried his team to the brink of glory. But RPI was patient, and when George Servinis finished off a second period shorthander to send RPI up 2-0, it was just enough. Puppa held off the Friars the rest of the way for the school’s second NCAA crown, 2-1. RPI had established a modern era benchmark for excellence that dominated the middle part of the decade, and unfortunately for RPI fans, 28 years have passed since Servins scored the last NCAA goal for RPI. Addessa was never able to get his subsequent RPI teams to the mid-80s level of excellence (or an NCAA tournament berth, and left under difficult circumstances in 1989. Buddy Powers became coach in 1989, and was able to get RPI back to a 3rd place finish in the ECAC and an NCAA tournament berth by 1994, but UNH blanked the Engineers 2-0 in RPI’s Albany backyard regional. The next season in 94-95, Dan Fridgen took over the coaching reins, and despite a 6th place finish in ECAC play, his RPI squad caught a little lighting in a bottle, and won the ECAC tournament in Lake Placid, beating Colgate and Princeton to earn an NCAA auto bid and a trip to Madison, Wis, where Minnesota bagged a little revenge for 1954 with a 3-0 shutout of RPI. Fridgen had some more 20 win teams, but without any further serious playoff successes, Fridgen left in 2006, when Denver assistant Seth Appert, fresh off two NCAA titles in 2004 and 2005 , took over the program in 2006-2007. While Appert’s early teams have struggled on the ice, the foundation of success is being laid in Troy, as Appert is landing strong recruits and generating some campus enthusiasm. The official nickname of some of the school's Division III teams was changed in 1995 from the Engineers to the Red Hawks. However the hockey, football, cross-country, tennis, and track and field teams all chose to retain the Engineers name. The Red Hawks name was, at the time, very unpopular among the student body; a Red Hawk mascot was frequently taunted with thrown concessions and chants of "kill the chicken!" In contrast, the official 80’s hockey mascot known as The Puckman has always been very popular. The Puckman is an anthropomorphic hockey puck with an engineer's helmet. The hockey team plays a significant role in the campus's culture, drawing thousands of fans each week to the Houston Field House during the season. The team's popularity even sparked the tradition of the hockey line, where students line up for season tickets months in advance of the on-sale date. Another tradition since 1978 has been the "Big Red Freakout!" game held close to the first weekend of February. Fans usually dress in the schools colors Red and White, and gifts such as tee-shirts are distributed en masse. Hail, dear old Rensselaer, the college of our heart. For dear old Rensselaer, each man must do his part. True sons of Rensselaer, we'll always strive to be. Now, dear old Rensselaer, hail to thee. Hear the tramp, tramp, tramp of marching feet. Hear the rat-tat-tat of drums that beat. Hear the voices ringing loud and sweet. * Nicholas M. Donofrio, (1967), director of research at IBM, trustee. * J. Erik Jonsson, (1922), co-founder and former president of Texas Instruments Incorporated, and mayor of Dallas. * Joseph Gerber, (1947), founder of Gerber Scientific. * George Knapp, (1876), industrialist, founder of the Union Carbide Company. * William Mow, (1959) Founded apparel maker Bugle Boy in 1977. * Curtis Priem, (1982) NVIDIA co-founder, architect of first PC Video Processor, and many that followed, trustee. * John Rigas, co-founder of Adelphia Communications. * James Flaherty, actor and stand-up comedian. * Milton Brumer, (1923), chief engineer for the Verrazano-Narrows Bridge and George Washington Bridges in NYC. * Leffert L. Buck, (1968), civil engineer and a pioneer in the use of steel arch bridge structures, including the Williamsburg Bridge in NYC. * Dr. Allen B. Dumont (1924), perfected the cathode ray tube and is considered the "father of modern TV"
* Frederick Grinnell, (1855), inventor of the modern fire sprinkler. * Walter Lincoln Hawkins, (1931), African American inventor of plastic telephone wire. * Marcian Hoff, (1958), the "father of the microprocessor"
* Washington Roebling, (1857), chief engineer of the Brooklyn Bridge. * James Salisbury, (1844), physician and inventor of the Salisbury Steak. * Raymond Tomlinson, (1963), inventor of the electronic mail (email) system. * J. Frank Aldrich, (1877), United States Representative from Illinois. * Myles Brand, (1964), president of the NCAA (National Collegiate Athletic Association). * Lincoln D. Faurer, (1964), director of the National Security Agency and chief, Central Security Service from 1981 to 1985. * Richard Franchot, US Representative from New York, (1861-1863). * Walter F. Lineberger, US State Representative of California, 1917-1921. * George Low, manager of NASA for the Apollo 11 project. Low was president of RPI from 1976 to 1984. * John Olver, (1958), Massachusetts State Representative (D), since 1991. * Ely S. Parker, Civil War Statesman, author of Appomattox Courthouse agreement. * Ivar Giaever, (1964), shared the Nobel Prize in Physics in 1973 for discoveries on tunneling phenomena in Semiconductors. * John L. Swigert Jr. (1965), an Air Force fighter pilot and test pilot, earned a master’s degree in aerospace science from Rensselaer’s Hartford campus in 1965 and in 1966 was selected by NASA in its 5th astronaut class. Member of Apollo 13. Recipient of Presidential Medal of Freedom,1970. State Representative for Colorado,1982. * John Carter, (1986), NHL forward from 1986 - 1993. * Erin Crocker, (2003), female NASCAR driver. * Kevin Constantine, (1980), ice hockey coach - Head Coach of the San Jose Sharks from 1993 - 1995, the Pittsburgh Penguins from 1997 - 2000, and the New Jersey Devils from 2001 - 2002. * Don Cutts, (1974), NHL and International Hockey League (1945–2001) goaltender from 1974 - 1984. * Tim Friday, (1985), NHL defenseman for the Detroit Red Wings from 1985 - 1986. * Joé Juneau, (1991), NHL forward from 1991 - 2004, top scorer at the 1992 Winter Olympics while playing for the Canadian Olympic hockey team. * Ken Hammond, (1985), NHL defenseman from 1985 - 1993. * Eric Healey, (1998), free agent, played in NHL with the Boston Bruins. * Michael E. Herman, (1962), President of the Kansas City Royals of Major League Baseball from 1992 - 2000. * Mike McPhee, (1982), NHL forward from 1983 - 1994, won the '85-86 Stanley Cup with the Montreal Canadiens. * Matt Murley, (2002), NHL forward from 2003 - 2008. * Kraig Nienhuis, (1985), NHL forward from 1985 - 1988. * Adam Oates, (1985), NHL forward from 1985 - 2004, 6th on the NHL's all-time assists list. * Matt Patricia, (1996), Linebackers Coach for the New England Patriots. * Brian Pothier, (2000), NHL defenseman for the Washington Capitals. * Daren Puppa, (1985), NHL goaltender from 1985 - 2000. * Brad Tapper, (2000), NHL forward for the Atlanta Thrashers from 2000 - 2003. * Graeme Townshend, (1989), Player Development Coordinator for the San Jose Sharks, NHL forward from 1990 - 1994. Troy the county seat of Rensselaer County. As of the 2000 census, the population was 49,170. Troy is located on the western edge of Rensselaer County and on the eastern bank of the Hudson River. Troy has close ties with the nearby cities of Albany and Schenectady, forming a region popularly called the Capital District. This area makes up the bulk of the Albany-Schenectady-Troy Metropolitan Statistical Area (MSA) with a population of 850,957. The site of the city was a part of the Van Rensselaer grant of 1629. Dirck Van der Heyden was one of the first settlers. In 1707, he purchased a farm of 65 acres (26 ha) which in 1787 was laid out as a village. A local legend that a Dutch girl had been kidnapped by an Indian male who did not want her to marry someone else gained some credence when two skeletons were found in a cave under Poestenkill Falls in the 1950s. One skeleton was female and Caucasian with an iron ring. The other was Native-American and male. The name Troy (after the legendary city of Troy, made famous in Homer's Iliad) was adopted in 1789, and the region was formed into the Town of Troy in 1791 from part of the Rensselaerwyck Manor. The township included the current city and the town of Brunswick. Troy became a village in 1801 and was chartered as a city in 1816. In 1900, the city of Lansingburgh was merged into Troy. In the post-Revolutionary War years, as central New York was first settled, there was a strong trend to classical names, and Troy's naming fits the same pattern as the New York cities of Syracuse, Rome, Utica, Ithaca, or the towns of Sempronius, Manlius, or dozens of other classically named towns to the west of Troy. Through much of the 19th and into the early 20th century, Troy was not only one of the most prosperous cities in New York State, but one of the most prosperous cities in the entire country. Prior to its rise as an industrial center, Troy was the transshipment point for meat and vegetables from Vermont which were sent by the Hudson River to New York City. The Federal Dam at Troy is the head of the tides in the Hudson River and Hudson River sloops and steamboats plied the river on a regular basis. This trade was vastly increased after the construction of the Erie Canal, with its eastern terminus directly across the Hudson from Troy at Cohoes in 1825. Troy's one-time great wealth was produced in the steel industry, with the first American Bessemer converter erected on the small Postenkill river in a small valley near the middle of the city. The industry first used charcoal and iron ore from the Adirondacks. Later on, ore and coal from the Midwest was shipped on the Erie Canal to Troy, and there processed before being sent on down the Hudson to New York City. The iron and steel was also used by the extensive federal arsenal across the Hudson at Watervliet, New York, then called West Troy. After the American Civil War, the steel production industry moved west to be closer to raw materials. The presence of iron and steel also made it possible for Troy to be an early site in the development of iron storefronts and steel structural supports in architecture, and there are some significant early examples still in the city. Troy was an early home of professional baseball, and was the host of two major league teams. The first team to call Troy home was the Troy Haymakers, a National Association team in 1871 and 1872. One of their major players was Williams H. "Bill" Craver, a noted catcher and Civil War veteran, who also managed the team. Their last manager was Jimmy Wood, reckoned the first Canadian in professional baseball. The Troy Haymakers folded, and Troy had no team for seven seasons. Then, for four seasons, 1879 to 1882, Troy was home to the National League Troy Trojans. The Trojans were not competitive in the league, but they did have the biggest hitter in professional baseball, Dan Brouthers. For the 1883 season, the Trojans were moved to New York City where they became the New York Gothams, better know later as the Giants. The Gothams had the same ownership as the New York Metropolitans of the rival American Association. As a result classic Met players became Giants, including Hall of Fame Pitcher Tim Keefe. Troy was also the birthplace of the famous player Michael Joseph "King" Kelly. Troy has been nearly destroyed by fire three times. The Great Troy fire of 1862 burnt the W. & L. E. Gurley, Co. factory, which was later that year replaced by the new W. & L. E. Gurley Building, now a National Historic Landmark. When the iron & steel industry moved to Pennsylvania and beyond, and with a similar downturn in the collar industry, Troy's prosperity began to fade. After the passage of Prohibition, and given the strict control of Albany by the Daniel P. O'Connell political machine, Troy became a way station for an illegal alcohol trade from Canada to New York City. Likewise, the stricter control of morality laws in the neighboring New England states, left Troy with openly operating speakeasies and brothels. Gangsters such as Legs Diamond conducted business in Troy. This gave Troy a somewhat colorful reputation through World War II. A few of the finer houses have since been converted to fine restaurants, such as the former Old Daly Inn. Like many old industrial cities, Troy has had to deal with not only the loss of its manufacturing base, but a drainage of population and wealth to suburbs and other parts of the country. Troy's population in 1910 was over 75,000, this is more than 50% higher than today. These factors have lead to a sizable degree of dilapidation and disinvestment, although numerous efforts have been made to preserve Troy's architectural and cultural past. RPI is struggling this year to score goals, and while the defense and goaltending for RPI are improving, they simply don’t have the team speed or depth of firepower to hang with Denver, especially without Helfrich in the lineup. For RPI to have a chance for an upset, they are going to need great goaltending from Lange or York, and some further inside magic from Appert, who recruited many of the Denver players. Denver should be able to work in transition with three better lines than RPI, and wear them down at altitude. RPI hung with BU earlier in the season but have not yet beaten a ranked team, and I don’t expect it to be the Pioneers. I think Denver is playing strong hockey, has greater depth of talent at all positions, and should handle RPI if the teams should meet. Prediction: Expect the Pioneers to beat RPI, 4-1.